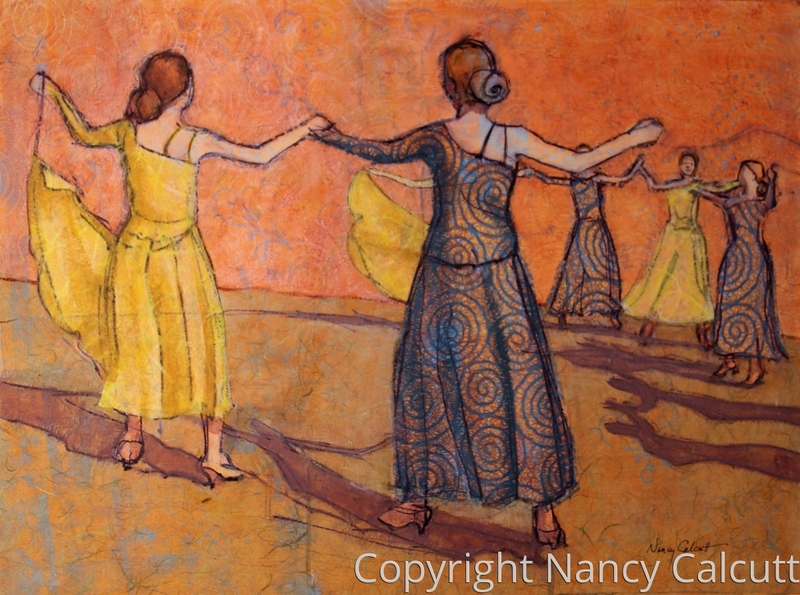 “Circle Dance”, an 18” x 24” x 1.5” figurative painting on cradled board, depicts a group of female dancers performing a traditional circle dance. It is a mixed media painting done with acrylic, ink, and rice and lace paper. The painting comes wired and ready to hang, no frame needed, as it is 1.5 inches deep and painted black on the sides. Dancers are often depicted in my work because I am a fan of dancing as a participatory activity and also to watch. I grew up with a mother who loved to dance (and sing); my mother is not a trained dancer, but she always enjoyed kicking up her heels. I remember going to the local Polish Hall and doing the polka with her. She is 90 years old now and still talks of doing the jitterbug when she was young. My parents used to square dance when I was growing up and they also performed patterned dances called “round dances”, if I remember correctly. I remember learning some of these round dances and it was loads of fun to do them. My parents belonged to a square dance club and I used to go and watch them dance sometimes. I particularly loved the colorful outfits that they both wore, especially my mother’s outfits with the big, bouffant skirts and lace under layer slip that was made to stand out from the waist and push the skirt out. I’m a sucker for a great outfit. I think “Circle Dance” was inspired by my parents square and round dancing days and the fun of dancing in a group, like todays line dancing. This painting started as a gesture drawing with a black ink pen on top of a painting panel that I had prepared ahead of time with and abstract design. The gesture drawing was done quickly to capture movement and the general shapes of the composition. Notice the quirky cast shadows on the ground created by the dancers. When I was done with this painting, I was particularly happy with it because the finished piece shows a lot of the original, expressive gesture drawing that I started with. There is a lot of actual texture in this piece that cannot be fully appreciated from a photo of the piece. The painting is finished with a couple of layers of wax varnish, which protects it from harm. The painting can also be buffed or cleaned with a soft white cloth.